Before dealing with the issue of concealing scars with scalp micropigmentation, post hair transplant, you need to understand the reality of hair transplantation and the inevitability of scarring. It's clear and obvious that a hair transplant is going to be a procedure that will be performed by a specialist. However, you may be surprised to learn that sometimes the level of competency is often alarming, particularly when transplants are sought in low cost clinics in countries like Turkey. Older methods of hair restoration tends to be, more commonly, follicular unit transplants, also known as strip harvesting or FUT, which would frequently leave scarring owing to the very nature this invasive surgery. FUT hair restoration is a process whereby a strip of hair is extracted, often from the rear of the scalp, and thereafter transplanted onto the recipient site. This particular technique can leave linear scars around the donor zones. Yet the length of the particular scar in question, will relate to the skill level of the surgeon that performed the transplant in the first place. Alternatively, the more modern form of hair transplants, follicular unit extraction, or FUE restoration, will be less likely to leave significant scarring, yet the scars are definitely there and become more visible as further hair is lost. FUE is also an invasive form of surgery whereby one to four groups of hair are extracted from the donor site and then placed in its recipient site. Scars, if visible, will be a selection of small circles around the donor site. And finally… thankfully, predominately phased out in the '90's – hair plugs. This was typically where patches of scalp were removed from the back and sides of the head, then placed onto the relevant recipient site, such as the front or top of the scalp. 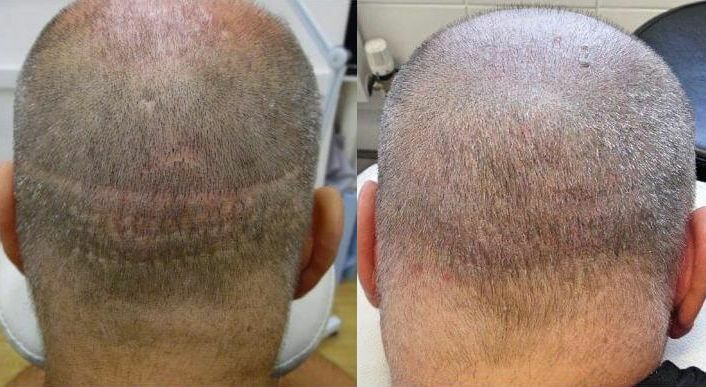 Scarring is generally very evident and scalp micropigmentation is a great solution for this type of visual flaw. If you're considering hair restoration procedures, be under no illusion that there is no such thing as a scar-free hair transplant. If you would like more information regarding scalp micropigmentation then call us today on 0845 625 0025 or you can send us a message by clicking here. How can Micropigmentation hide Scars? In essence, scalp micropigmentation, or SMP, is the process of having your scalp tattooed with a series of minor dots, that will imitate a shaven head of hair without any surgery or scarring. Scalp micropigmentation use natural pigments, administered at epidermal level which, in turn, recreates the appearance of a natural hairline. It's a procedure that is similar to tattooing, yet it doesn't penetrate to quite the extent, henceforth, the color is much less disposed to change over sustainable periods. Most commonly used as a modern solution against thinning or hair loss, another significant use for scalp micropigmentation is to conceal scars after hair transplants. It's a tried and tested process and has proven to be a popular method for both hair thinning and camouflaging of evident cicatrices. It's an effective solution for both plights and will invariably still be around for years to come. Although it is perfectly possible to use SMP just on the scarred areas, it is common and recommended that a full head procedure be completed at the same time. Hair transplant recipients often lack overall hair density, so this is an ideal opportunity to tackle both your thinning hair and your scars. The best camouflage is achieved when the scars are flat and well healed. At Skalptec we achieve great results even when scars are more challenging, however we may recommend some interim measures to improve the appearance or texture of your scars prior to your scalp micropigmentation procedure. If your scarring is still undergoing the healing process, it's ideal to wait until it has completely healed and recovered before considering further treatment.